Marko Arnautovic has dismissed speculation linking him with a January move to China by confirming that he will remain at West Ham - for the rest of the season. 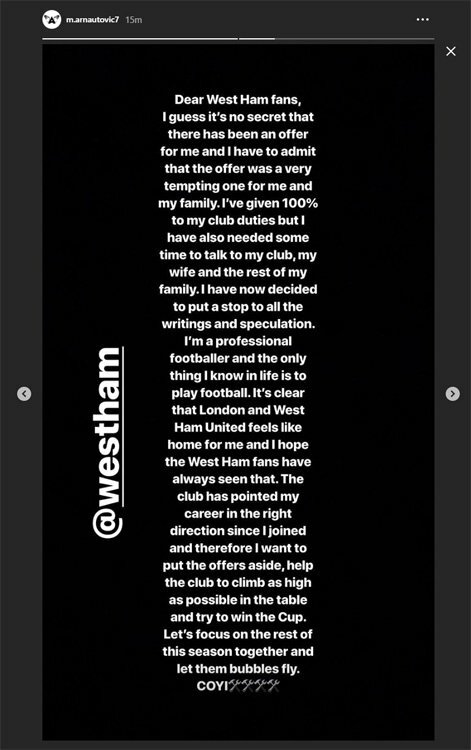 The Austrian international confirmed in a statement on Friday afternoon that he would be staying at West Ham - for the time being, at least. "I guess it's no secret that there has been an offer for me and I have to admit that the offer was very tempting one for me and my family," he wrote, speaking via his Instagram channel. "I've given 100% to my club duties but I have aslo needed some time to talk to my club, my wife and the rest of the family. I have now decided to put a stop to all the writings and speculation. "I'm a professional footballer and the only thing I know in life is to play football. It's clear that London and West Ham United feesl like home for me and I hope the West Ham fans have always seen that. "The club has pointed m,y career in the right direction since I joined and therefore I want to put the offers aside, help the club climb as high as possible in the table and try to win the Cup. "Let's focus on the rest of the season together and let them bubbles fly."